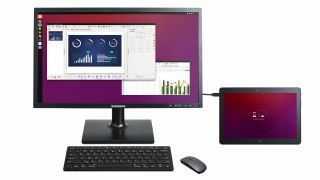 Canonical has launched a new tablet running its Ubuntu operating system, but instead of going after the likes of the iPad Air 2 it's gunning for the desktop computing market. That's because the BQ Aquaris M10 Ubuntu Edition's Unity engine can adapt to different scenarios, whether it's a touch input on the tablet itself or hooked up to a monitor, mouse and keyboard. The M10 seamlessly switches between interfaces, depending on the peripherals connected (or not connected) to it, changing not only your input controls but the windows on screen. Techradar was given a brief demo of the M10, and it appears to offer a solid yet basic computing platform and tablet experience. The lack of apps compared to Android and iOS will mean consumers are unlikely to pay too much attention to it, but there are some wins for businesses looking to consolidate their device portfolio. The tablet itself boasts a 1.5GHz quad-core Media-Tek processor, 2GB of RAM and 16GB of storage, which isn't exactly home computing power. Think of this more of a Chromebook and Windows Continuum rival, rather than something that will replace your laptop or PC. There's also a microSD slot, 8MP camera and a 10.1-inch display crammed into the Aquaris M10's 8.2mm thick body which tips the scales at 470g - not that much heavier than the 437g iPad Air 2. The BQ Aquaris M10 Ubuntu Edition is due to go on sale sometime in March, although pricing is yet to be revealed.